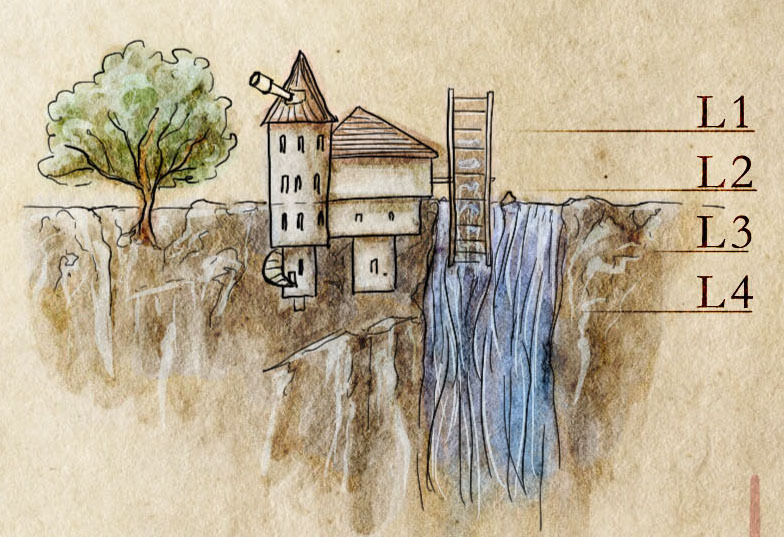 So – the hook of the map was a wizard’s tower in a water powered mill. With that, I started with my pad of paper and a ballpoint pen, and put together a sketch. I admit the ordering is a little haphazard. My wizard has an odd hierarchy of needs. Any wizard’s tower should be a little unusual, and have multiple levels. In this case I decided to have the mill overhang the cliff, and have levels going down as well as up. In addition, it would be remiss to have a waterfall, and to not have a secret hidden cave behind it. First things first, a thumbnail sketch of the side view. The elevation sketch of the Arcanist’s Tower, with the four levels outlined. Level 2 (the ground level) should be the most benign of the levels, along with the top tower level – as they are both visible for all to see. Levels 3 and 4 are where the secrets are kept. Ground level, what should a visitor see? The first section that I detailed out was the ground level – the most banal of the areas. This has a mill room, and a bedroom. A horse grazing in the paddock, and a creaky old wagon. Why would there be anything of concern here? The river runs placidly over the cliff, and the waterwheel creaks, turning the mill stones every day. The ground level – nothing but milled flour, and a horse. Beneath the simple exterior, there’s a few things going on here. The bedroom has lots of windows. The tree overhanging the cliff is directly outside the windows, and provides a spying route, or potentially an acrobatic access to the tower. 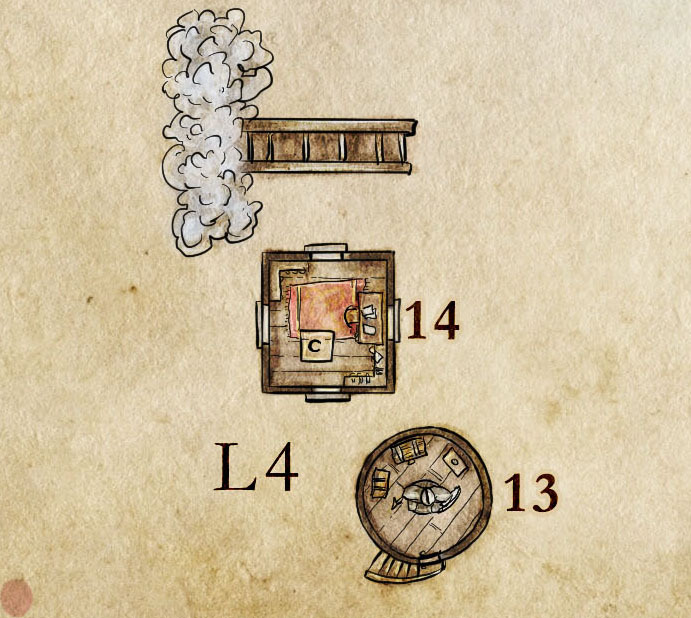 In addition, once you’re out on those tree branches, you’d be able to see the lower levels, and the Arcanist’s Mill will begin to give up it’s secrets. The other interesting feature is the eddy in the river. Just above the tree, there’s a mini spiral in the river. This is an access point – a small waterfall that sources a secondary waterfall inside the cave lair of the Arcanist. It’s here on the map, but a player who sees the map won’t necessarily know that this is more than an illustrative flourish. The tower top is simple and benign. A telescope, a fire, and kitchen supplies. Anyone visiting would accept that this is the wizard equivalent of a bachelor pad with a beer fridge and a massive flatscreen tv. But, if we descend deeper to Level 3, we find the true nature of this mage. Under the surface, the arcanist is not so nice. The first hint that not all is as it seems is the lab (5). Here mechanical automata are constructed from raw materials, and sparked to life by the water powered lightning machine in 6. The lightning generators are powered by a vertical drive from the mill stones directly above. Those that can make it through the lightning room, will fid locked and trapped doors, that open onto a rope bridge that leads behind the waterfall. Once within, the true scope of the operation becomes apparent. The cave complex has a second waterfall (entering from the river above). supplies and stores, and a second lab. Here prisoners from the pen (12) are dissected for their vital essence to infuse the automata with their terminal needs. The completed automata live in 11 – ready for the Arcanist’s call. All of those routes come with advantages and disadvantages – but the players will hit all the major locations. If they come into the cave first, they’ll discover the bridge, and come at the lightning room having found the horror already. If they come from the mill they’ll already have an inkling of what is ahead. 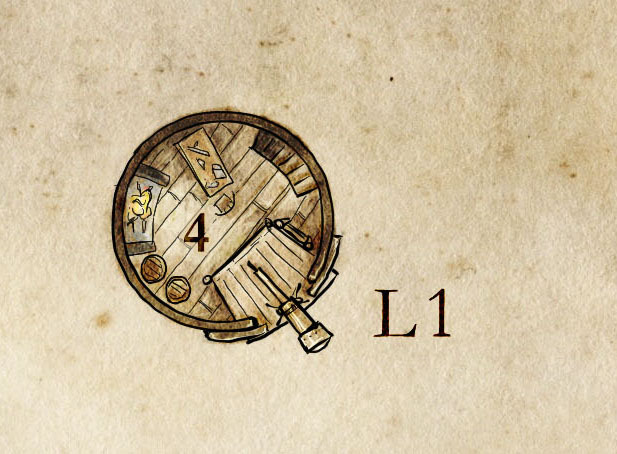 Finally – level 4: loot! For the lowest levels, the map is fairly sparse. The lowest tier of the round tower has an outside staircase (remember that element on the side view?). That comes to a locked door, and if the adventurers barge in, they find a massive statue, that clearly has to be a construct protecting the wizard’s most prized treasures. A GM might decide to have that statue be able to bull rush a bolshy adventurer back out of the front door, over the staircase, and into space. This is a very small room, and a very big statue. Many adventurers handle golems by staying as far away as possible and destroying them with ranged attacks. Unless they can fly, that’s going to be tough here. This is a nasty, close up, melee fight with a brutish statue. They’ll have to work for their treasure. The study is another meditative room – with the soothing sound of the waterfall, and creak of the waterwheel. They can get here through the trapdoor in the lightning room, or they can get onto the waterwheel, ride it round to the lowest point, jump across to the window sill, and break in through the window. I’m not sure why you’d do that, but players are players, and this provides a clear option for daring heroics. And, as any player worth their salt knows, those bookshelves contain the real treasures here. 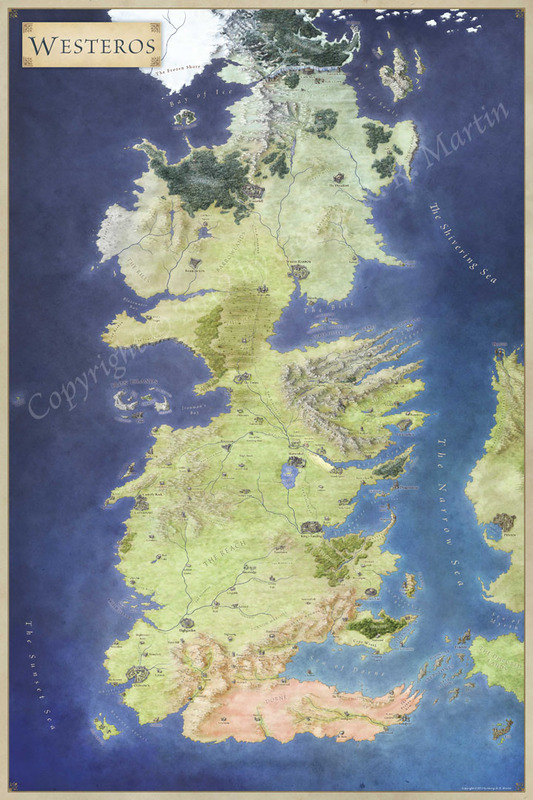 The map was illustrated start to finish using an iPad Pro and Apple Pencil, in Procreate (if you’re interested in my thoughts on that combo I have a review here). I used Photoshop at the very end to add labels and final layout tweaks. 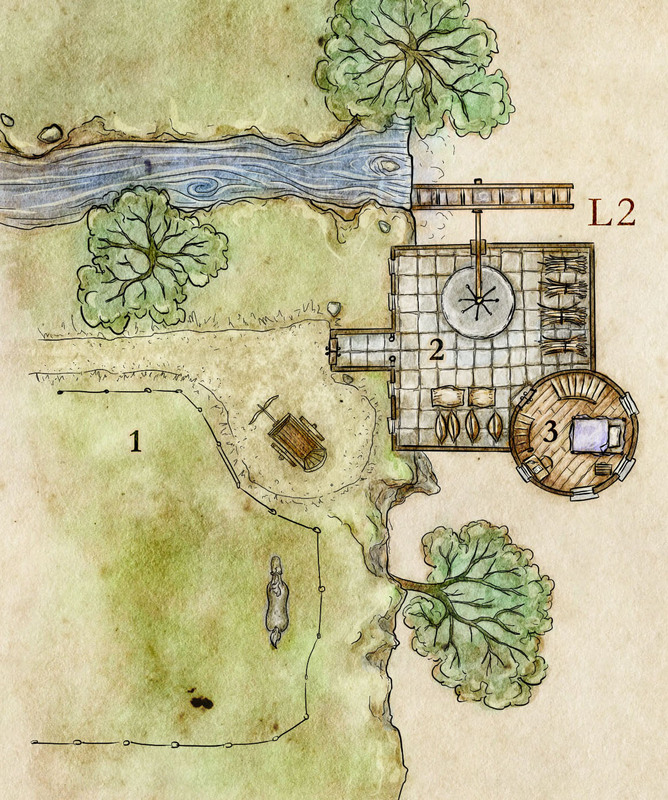 If you’re interested in more maps for free, I have a page of free maps here. 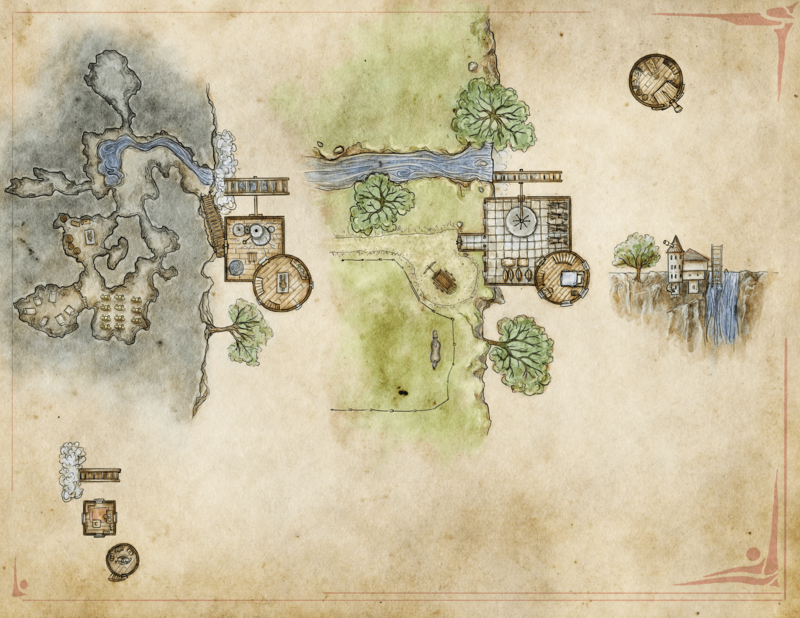 If you’d like some maps that are higher polish and greater resolution, geared for use with virtual tabletop software, I have full high res map packs for sale here. What an excellent map, both artistically and adventure-wise! Recently, I’ve started using an iPad Pro + Pencil myself. 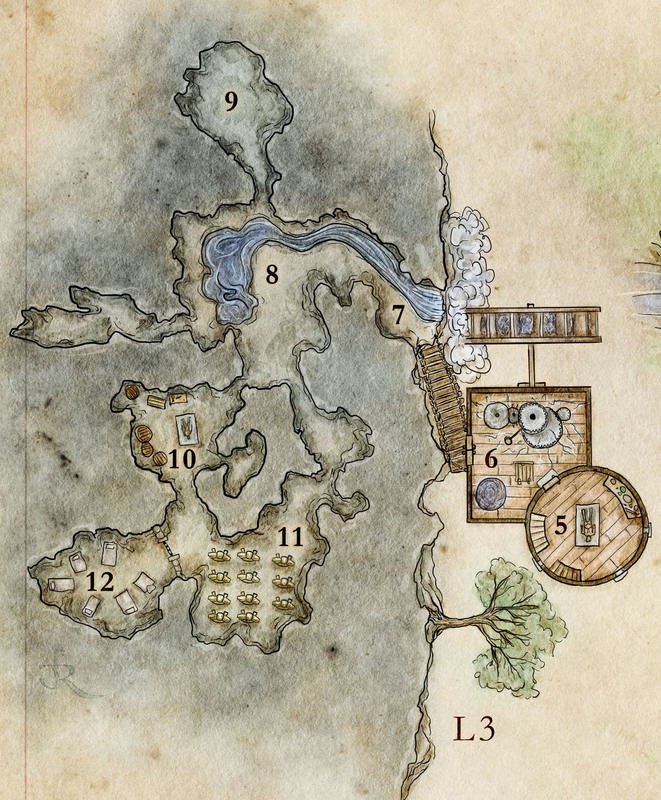 It would be very inspiring to see the Procreate-video from your drawing session of this map. Any chance you have it around? Again, this is very inspiring stuff, thanks a lot for sharing! I do, as it happens. Cleaning up a little and then I’ll add it. I have been playing D&D for over 25 years and every now and again I come across something like THIS! Truly inspirational and designed with care, made me want to rush out and find players again! Thank you. I’m so glad it was such an inspiration! This has been a godsend. 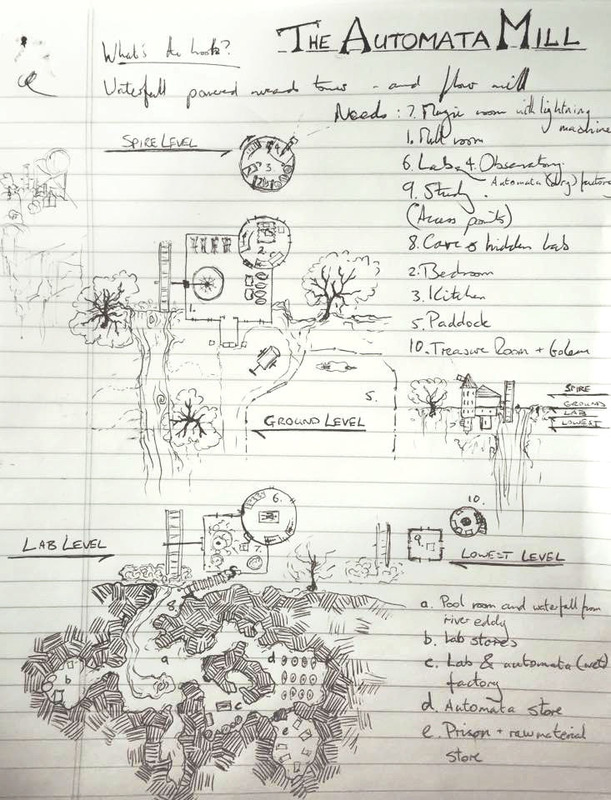 I fed my players a rumor that lightning always strikes in the same place (a wizard tower) an began to look around for a map to feed my imagination. This was exactly what I needed and then some, it reworked my original idea completely, and gave the perfect explanation why lightning always strikes the same place (a mill can only generate that much power, the Arcanist needed more). Beautiful map and clever story, thank you for this. I have a question. Does all your maps are done in RGB mode ? I lately started working in CMYK and i have noticed significant difference in Overlay blend mode.It behaves like desaturated black and it is too pale to actually use it as a shadow. Thanks, that explain a lot, i was wondering how you are making shadows in CMYK. Never thought of transforming it after everything is done. Having gotten my start with 1e AD&D in 1978, and being a staunch proponent of mapmaking as a required skill set for a DM, allow me to salute you for putting this wonderful page together. I hope that it will inspire many to begin creating and designing their own maps for tabletop rpg fun. This is incredibly well designed. My players will love it. Thank you very much. Wonderful! Hout of curiousity, are you making significant tweaks to your brush set for Procreate or going with the standard? Also, would you mind sharing your canvas settings?